A fast-moving fire at this house on Fillmore Avenue and Woeppel Street claimed the life of 7-year-old Alexavier Torres-Santiago on Sunday. Outside the gutted 2½-story building at Fillmore Avenue and Woeppel Street, evidence of a tragedy was piled on the sidewalk. A family’s belongings were strewn among heaps of ash and rubble – a pink toy purse, a single high-heeled black boot, a hat with ear flaps. Tucked into the coils of a heat-warped mattress was a vase filled with fresh flowers and a brown and white stuffed bunny, a makeshift memorial to 7-year-old Alexavier Torres-Santiago. The Frank A. Sedita Elementary School 30 student never had a chance of escaping from the fast-moving fire that apparently trapped him in a rear bedroom of the second-floor apartment early Sunday, authorities said Monday. 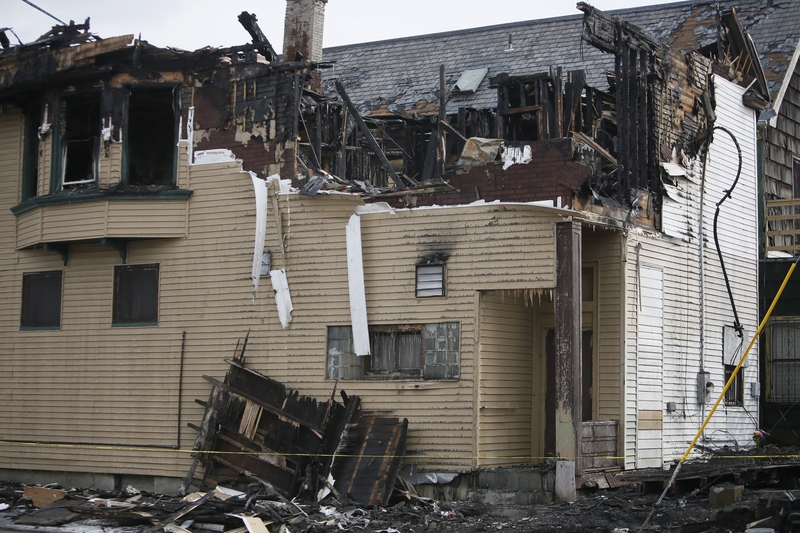 City fire marshals and police continued their investigation into the blaze that killed the boy and left his parents, three siblings – 11, 9, and 6 – and another adult family member homeless. Authorities pointed out that the family relied on space heaters to warm their home and the devices might have played a role in the blaze, but Fire Commissioner Garnell W. Whitfield Jr. stressed that many questions remain unanswered. Foul play, investigators said, does not appear to be a factor. A source familiar with the deadly fire said Alexavier was believed to have been in a rear, add-on bedroom that became rapidly engulfed in flames. “It happened so fast. The child died of smoke inhalation and other causes. No one could have saved him,” the source said, requesting anonymity because of the ongoing investigation. Questions investigators are reviewing include whether there were smoke detectors, the exact location where the fire started, what sparked it, and whether there were building code violations on the house, according to Whitfield. Firefighters arrived within four minutes after receiving several 911 calls shortly before 7 a.m. Sunday about a house fire with people trapped inside at 1400 Fillmore, Whitfield said. When firefighters arrived, everyone in the family except the boy had managed to escape, the commissioner said. The survivors were transported to Women & Children’s Hospital, where they were treated for minor smoke inhalation and bruises before being released. Several miles from their burnt-out East Side home Monday, Alexavier’s mother, Sara Santiago-Delgado, and his stepfather, Carlos Rodriguez, along with other relatives appeared heartbroken as they arrived at Buffalo Police Headquarters to speak with investigators. The Spanish-speaking family said little when asked about the tragedy, but the looks on their faces and their tears told of their despair. Since the fire, they have been staying with other relatives, and it is believed that they only recently arrived in Buffalo, according to authorities. Neighbors of the Fillmore Avenue apartment said the family took up residence in the second-floor apartment about a month ago. A first-floor apartment in what once was a storefront did not appear to be occupied, fire officials said. Once investigators have completed their work at the scene, Whitfield said, the structure will be demolished. Ali Mutha, owner of the nearby Fillmore Food Market, said he was just starting to become acquainted with the new arrivals to the neighborhood. School Superintendent Pamela C. Brown issued a statement expressing the sadness of the district. Amid the burnt-out remnants of the house Monday, some men were scavenging fallen lengths of aluminum siding. They said they intended to sell the metal at a scrap yard. Yet even these scrappers were not without sympathy. “We’re sorry for the family, and may God bless them,” said one who called himself John.